On May 9 the North American première of the hit West End musical "Mamma Mia!" opened at the Royal Alexandra Theatre. The record-breaking advance sales have already made it such a hit in Toronto that the Mirvishes have extended it past its former closing date in September to August 2001 and will send the present cast on a US tour. The show itself is so delightful, so clever and so well performed that it's bound to be a hit wherever it goes. After years of pretentious, doom-laden musicals that were anything but comic, it is a treat to see a musical that is what musicals originally were--a musical comedy. As everyone knows by now, “Mamma Mia!” is built around 22 songs by Benny Andersson and Björn Ulvaeus of the 1970’s Swedish pop group ABBA. While writing the book after the music is the backwards way to write a musical, there is a history of such works from at least “Wiener Blut” (1899) to “Kismet” (1953) to “Crazy for You” (1993) that have been very successful. What is essential is a book so ingenious that the songs seem to arise from the situations, masking the fact that the situations have been devised to fit the songs. Just such a book is what Catherine Johnson has written. Johnson deftly sets up the whole plot of the show within the first 20 minutes. Donna Sheridan, a former member of a Seventies girl group, Donna and the Dynamos and a happily unwed mother, has been running a taverna on a Greek island where she has raised her daughter Sophie, now 20, who is planning to marry her boyfriend Sky in a big white wedding. Sophie has been reading her mother’s diary and, given her mother’s wayward past, realizes that there are three possible men who could be her father. Clearly more conservative than her mother, Sophie invites all three to the wedding hoping to find out who really is her father and to have him give her away at the wedding. Once the Donna’s two “Dynamos” and three ex-boyfriends arrive, everything is set. What easily could have been merely a farce or situation comedy strangely enough turns into a comedy of character as the story moves forward primarily through a series of one-on-one encounters between the four women and four men. To add to the symmetry, Sophie has two girlfriends visit and there are two male attendants at the taverna. The introduction of the ABBA songs are often greeted with laughter from the audience as if they were the punchline to a joke, and in many ways that is what is happening. Over and over we get involved in the confection of the plot only to realize it is leading to a song we already know. Johnson and the director appeal to an adult sense of play by constantly surprising us with new contexts for songs we already know. And Johnson provides a wide variety of contexts for the songs--as part of a diary, as a man quoting his ex-wife, as background music in a disco, as songs sung as songs, along with the conventional use of songs as private meditations or expressions of feeling toward other people. On their own, ABBA’s most popular songs are almost entirely in the form of one person addressing another. What gives them a certain “generic” quality is that we don’t know the context in which they are supposed to occur. “Mamma Mia!” actually enhances the songs by giving them a specific context, to the extent that if you listen to ABBA Gold CD after the musical, you can’t avoid thinking of the context of the song as it appeared in the musical. The songs benefit from variety in another way by being sung not just by ABBA’s two A’s, Anni-Frid and Agnetha, but by eight different voices and a chorus. The motto both for the book and for Phyllida Lloyd’s superb direction could be “Knowing Me Knowing You”. Like Johnson, Lloyd knows we know what the real set-up is between the story and the songs. Therefore, she brings this sense of our “knowing” into her direction. When Sophie and her friends sing “Honey Honey”, it is portrayed as part of her mother’s diary from the 1970s thus allowing the girls to make fun of such just-too-Seventies expressions as “love-machine”. When Donna sings “Money Money Money” about running her taverna, she looks up in surprise when the people gathered there suddenly sing as the chorus. At other times, when a character supposedly sings a song alone, but which in the ABBA version has a chorus, Lloyd has a group of heads suddenly appear over a wall to sing along. All of this climaxes in the hilarious dream sequence that begins Act 2 where Lloyd both makes fun of and has fun with the very stage images she has already used such a dancing chorus of people in Day-Glo scuba gear. From then on, having established that she knows that we know, the show proceeds in a straight fashion. A wise choice, since by then we are caught up in the plot and actually do want to know who the father is and what will happen at the wedding. Lloyd is helped by a very savvy design team. Mark Thompson’s set mirrors the structure of the show by having two curved walls which in various orientations represent the outside or inside of the taverna or separate rooms inside. His costumes are also witty, from the Seventies revival clothes of the Sophie’s generation, to the outrageous togs of Donna’s two girlfriends to the ultra-Seventies rock singer gear for the fantasy concert that closes the show after the curtain call. 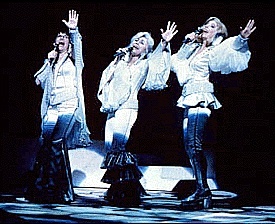 Howard Harrison’s lighting includes creating the illusion of a sun-drenched Greek island to cabaret lighting when Donna and the Dynamos perform, to black-light mirror-ball effects over the whole audience. While I enjoyed Anthony Van Laast’s choreography, I did wish there was more of it and thought the show could have used at least one extended dance number. The show has a very strong, energetic and likeable cast. The most important role is that of Donna (and it’s about time a middle-aged woman was the focus of a musical!). Canadian musical veteran Louise Pitre was superb. Eschewing ABBA’s own glossy presentation, she uses the various moods of the songs build up an interesting character and makes the lesser-known “Slipping Through My Fingers”, a mother’s reflection on her daughter growing up, the emotional centre of the whole show. Tina Maddigan, a Newfoundlander fresh from Sheridan College, looks and acts just right as the daughter Sophie. Her voice tends to be a bit thin on top and she could learn from Pitre in how to carry an emotion from one scene and use it to build on in the next. As Donna’s two girlfriends, Gabrielle Jones and Mary Ellen Mahoney were a treat--Jones playing a feminist with convictions ready to be undermined and Mahoney a rich, jaded triple-divorcée. As Donna’s three ex-boyfriends, David Mucci as the Australian and Lee MacDougall as the Brit did as much as they could to make their characters more than stereotypes, but I never could warm to Gary P. Lynch, an American playing the American. Trying to make his character so intense put him at odds with the general mood of the show. Adam Brazier as Sophie’s boyfriend and Nicolas Dromard and Sal Scozzari as the taverna attendants all turned in good performances, especially the last two in their dance number with Mary Ellen Mahoney. The last time I had so much fun at a large-scale musical was at “Crazy for You”, itself a pastiche, though in many ways Ken Ludwig’s book for that show is much inferior to Johnson’s book for this show. ABBA’s songs obviously don’t have subtlety of George Gershwin’s music or the wit of Ira Gershwin’s lyrics. But what both shows have in abundance--and so lacking in most big musicals nowadays--is one catchy, tuneful song after another. I think this may the explanation why, to my surprise, everyone over sixty leapt to their feet as eagerly as those much younger to give a long standing ovation. Here, finally, was a musical comedy that was actually both musical and a comedy and gave you a real lift just like the old ones used to do. Photo: Gabrielle Jones, Louise Pitre and Ellen Mahoney. ©2000 Joan Marcus.